There are several subspecies/varieties of this orchid and so accurate identification can be difficult. 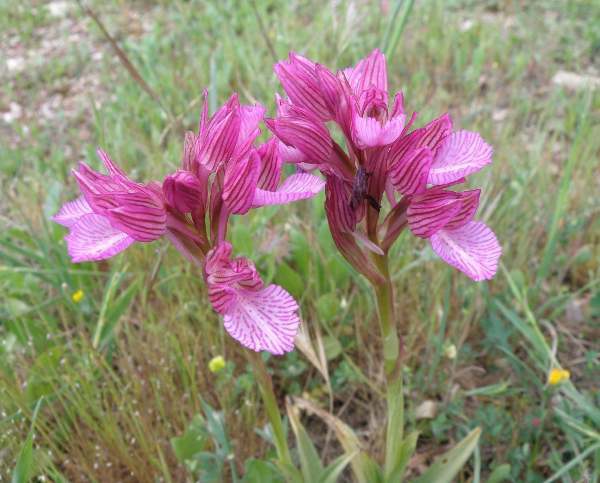 The pictures on this page were taken in Crete where both subspecies alibertis and heroica are known to occur in the same habitats of dry meadows and open woodland. They flower at different times, however, with heroica appearing much earlier - from the end of February to the beginning of April. ssp. alibertis blooms for a much shorter time, from the middle of April through to the middle of May. 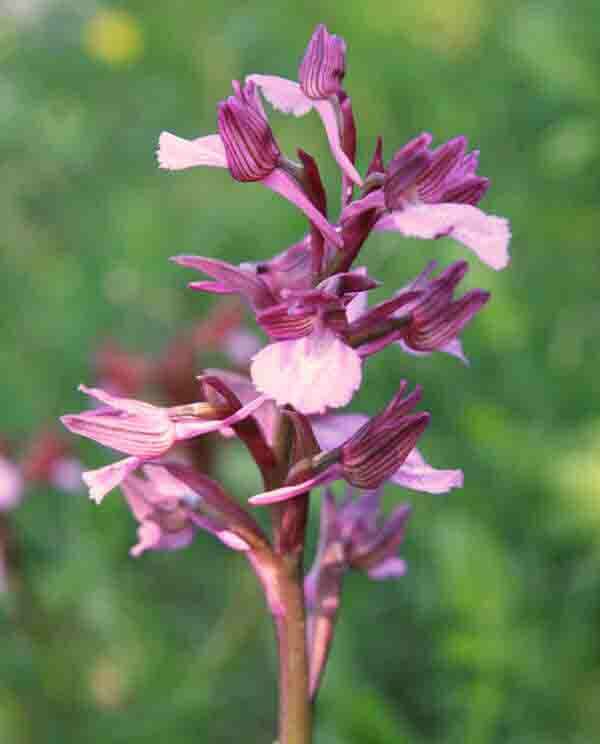 The Pink Butterfly Orchid plant is variable in size growing to between 15-40cm tall. It has 3-9 basal leaves and a further 2-5 smaller leaves clasping the upper stem. Each stem bears between 5-15 large pink flowers. The sepals and petals form a loose, darkly-veined hood over the broad fan-shaped lip of the flower.The lip is pale pink and has dark pink stripes emanating from the centre. The common name of Butterfly Orchid reflects the showy and colourful form of the flowers. The flowers are most attractive with the sepals and petals being much darker than the lip, which is covered with darker streaks and dots. Anacamptis papilionacea is a Mediterranean species with a geographical range extending eastwards to the Caspian Sea, south to North Africa and north to the foothills of the Alps. 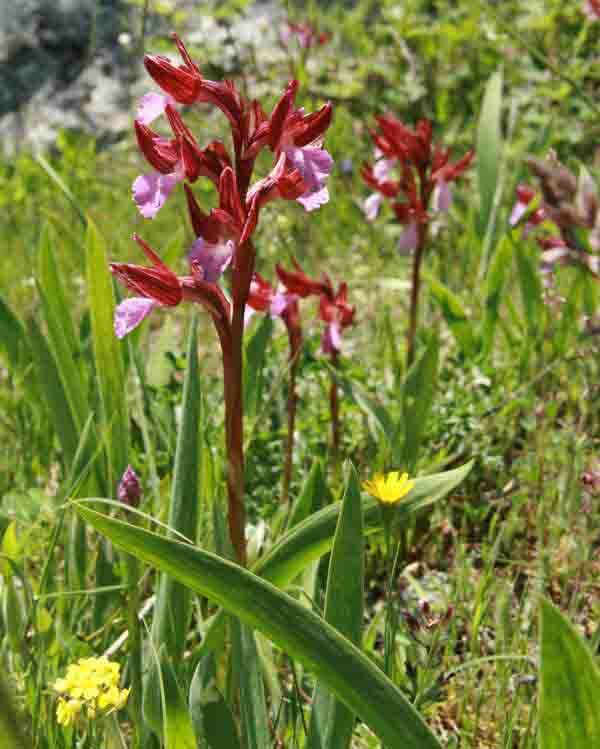 Limestone habitats are the place to look for this orchid where it grows on scrubland and open grassy places. Both specimens on this page were photographed in Crete.